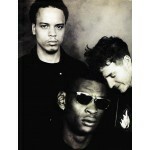 Massive Attack are a British musical group formed in 1988 in Bristol, United Kingdom, consisting of Robert "3D" Del Naja, Grant "Daddy G" Marshall and formerly Andy "Mushroom" Vowles ("Mush"). Their debut album Blue Lines was released in 1991, with the single "Unfinished Sympathy" reaching the charts and later being voted the 63rd greatest song of all time in a poll by NME.1998's Mezzanine, containing "Teardrop", and 2003's 100th Window charted in the UK at number one. Both Blue Lines and Mezzanine feature in Rolling Stone's list of the 500 Greatest Albums of All Time. The group has won numerous music awards throughout their career, including a Brit Award—winning Best British Dance Act, two MTV Europe Music Awards, and two Q Awards.They have released five studio albums that have sold over 11 million copies worldwide.